Specialty Coffee: Roastmaster’s Wisdom on Achieving Coffee Nirvana! As a kid, you may remember plenty of exciting reasons to get up in the morning. For some, maybe this brings back memories like mine, of pure and simple goodness that came through the love of another, like Grandma’s fabulous farm cooked breakfast. The tantalizing aroma of smoked bacon and fresh baked biscuits wafting through the house made it absolutely impossible to stay in bed! When I was just a boy, there was another aroma that captured my attention during our yearly family reunions at the farm. It became familiar and much loved, even before I had the pleasure of taste-testing the mystical source. Of course, I’m talking about the rich aroma of freshly brewed coffee that always seemed to create such a fuss around the house first thing in morning. If an amazing cup of coffee is one of the more important items on your menu of good reasons to get up in the morning, then please stick around. You should find this site both interesting and valuable. *	Side-step coffee mythology and get straight to the skinny on the exact recipe for the very best fresh-roasted coffee available anywhere on planet earth. *	Discover your favorite coffee or coffees that will suit you right down to your toes. *	Be demystified about how and where to get the best coffee imaginable and possibly the best coffee bargain on the net! *	Find out why 95% of the companies marketing coffee may say they have the best, but don’t. *	Learn the best methods for storage, grinding, and brewing. *	Clear up health issues concerning coffee consumption and know what alternatives are available if you love coffee but your tummy doesn't.... "Ouch"! *	Get great information and support on how to start and run your own coffee shop or café. *	Find the best source for bulk green coffee and fresh roasted wholesale specialty coffee. *	Be guided step by step, clearly, and concisely to experiencing..... "The Perfect Cup". This site is specific to how YOU can find the very best coffee in the world, at a reasonable price, and enjoy it with absolute, over-flowing satisfaction. I have purposely kept this site very simple and to the point for pleasant and easy browsing. I'll cover many other related subjects in the future, through issues of my informative coffee e-zine entitled: "Roastmaster's Corner". 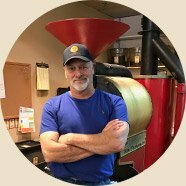 I am a specialty coffee Roastmaster with many years of experience in the industry. Please allow me to be your guide through the amazing world of coffee.